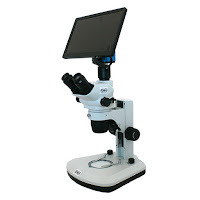 Microscope World has several new high resolution stereo zoom microscopes that come equipped with a high definition HD camera and a 12" LCD HD monitor. The FZ6ILST-HD stereo microscope provides magnification of 6.7x - 45x and bright LED top and bottom illumination. Magnification can be increased up to 180x with optional auxilary lenses and eyepieces. This microscope is perfect for industrial live work under the microscope because the camera provides 60 frames per second and full HD resolution. The tablet LCD HD monitor connects directly to the HD camera and provides crisp and clear images without cluttering the work surface or desktop table. The FZ6BB-HD stereo boom microscope is mounted on a ball bearing boom stand to provide easy access and room for larger objects. 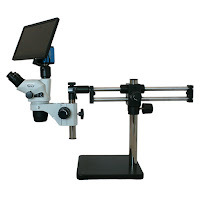 The viewing head of this microscope rotates and the ball bearing boom stand slides horizontally. Illumination options include LED ring lights or dual pipe lights. This stereo zoom microscope uses the same high definition HD camera and 12" HD LCD monitor. The camera provides a high frame rate of 60fps at full HD 1080p resolution. Optional auxiliary lenses and eyepieces can be used to increase or decrease magnification and working distance. The FZ6TS-HD digital stereo microscope is currently on sale and includes a 4-quadrant LED ring light for reducing glare when viewing reflective parts. The track stand has coarse focusing with smooth adjustment. The HD camera and 12" HD LCD monitor allows for live image viewing and image capture with an SD card. 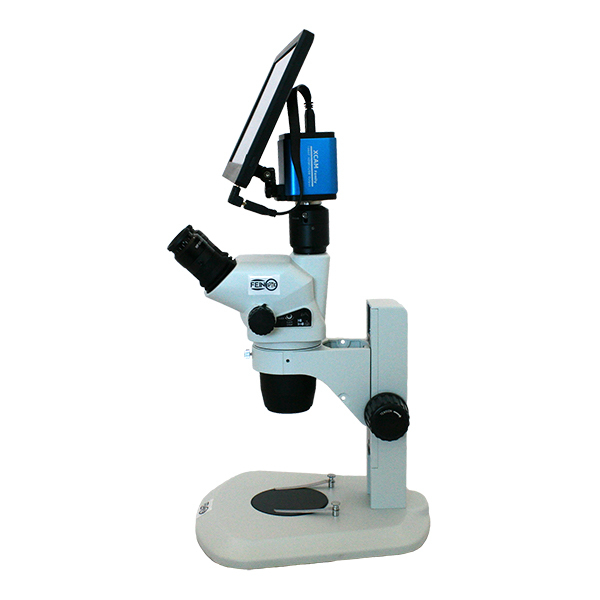 This HD microscope is best for small parts where no transmitted illumination is required. This microscope is available with click-stops if precise measurements need to be made. Contact Microscope World with any questions about HD microscope cameras and HD monitors. Why Use Microscope Immersion Oil?